"Behold; I will send my messenger, and he shall prepare the way before me . . ."
The source of the quote, the Book of Malachi, is the last section of the Old Testament, a few pages of prophetic fire and brimstone. It speaks of the "terrible" day of the Lord's return that will "burn like a furnace," leaving behind "not a root or a branch." The God of Malachi is a God who strikes vengeance on those he hates. He turns mountains into wastelands, and when the descendants of the scorned rise from the ashes, he exacts vengeance again. Make no mistake: "I the Lord do not change." Yet a few pages later the New Testament begins: Mary is pledged to Joseph, and before they have a chance to consummate, she is with child through the Holy Spirit. The Lord does change, He becomes flesh. He becomes a trinity. He sacrifices His only Son. He forgives the sins of man. Somehow, we are meant to believe that the God of Malachi is the same as the God of Matthew. To me, the disparities are irreconcilable. Yet, 2.4 billion people on this planet make the leap to faith that the God of the Old and the New Testaments are one in the same. Certainly, this conclusion is not reached through reasoned logic or critical inquiry. But it's also not necessarily ignorance—the Enlightenment owes much to Christian theology, from the scholastic philosophers to Isaac Newton. So, it's at least possible that something else brings humans to religion, an innate impulse or another way of knowing. Between 1901 and 1902, the Harvard psychologist and philosopher William James delivered a series of lectures in Edinburgh that were later collected and edited into a book titled The Varieties of Religious Experiences. James's project was to use the modern tools of science and psychology to interrogate the subjective phenomenon of the religious experience. In a section concerning "mystical states of consciousness," James gives a brief meditation on the nature mind-altering drugs. Looking back on his own experiences with nitrous oxide and ether, he writes, "they all converge towards a kind of insight to which I cannot help ascribing some metaphysical significance." Half a century later, Alan Watts, writing from the vantage point of the 1960s counterculture, connected the dots between the mystical and the psychedelic, asserting in his essay "Psychedelics and Religious Experience" that psychedelic experiences are "virtually indistinguishable from genuine mystical experience." 1, 1, 2, 3, 5, 8, 13, etc. Informally speaking, a collection is also recursive: its future states are defined in part by its past states. So is a life, a body, a city, a trip. After college, my wife, Zoe, and I spent four months living out of our Corolla, driving around the country. We had no set route. We went where we wanted to go, lingered when we found something we liked. Then we ran out of money and spent a winter in Key West, working jobs in the tourist industry. During that time, I applied to two graduate writing programs and was accepted to one, a medium-sized public university in a city I had never been, in the northwest corner of Washington state. The program wasn't prestigious. The funding was mediocre. But it was something, a direction. So, Zoe and I packed up the car and drove as far away from Florida as you can get without leaving the contiguous United States. Of the few moments in my life that qualify as mystical experiences, all of them have in common states of non-endogenous brain chemistry, i.e., mind-altering drugs. For example, once when I was a teenager, I ditched school with a friend and drove to Chicago, ate a few grams of psilocybin mushrooms, and spent the day at the Art Institute. By the time the trip was peaking, I was in a gallery devoted to post-impressionist paintings, standing in front of a Van Gogh self-portrait. James defines the mystical experience by describing four "marks," the first of which is ineffability, a quality of an experience that cannot be reduced to words. That was certainly my experience in the art gallery. But as I've retold the story over the years, I've given up on the paradoxical task of trying to transcribe the ineffable into words, and instead reduced it to a sort of joke, a caricature of a teenage drug experience: A teenager on mushrooms walks into an art museum, looks at a Van Gogh and says, "I get it now." When I decided to write an essay about Spirit of Elijah, I started by reading up on a cultural phenomenon called the Jesus movement. The movement first emerged alongside the counterculture in San Francisco in the 1960s, and like the hippie movement, it had a direct connection to psychedelics. Ted Wise, one of the early converts who brought a unique brand of hippie evangelism to the Haight, came to Jesus while tripping on acid. Throughout the '60s, similar factions of evangelical hippie Christians metastasized around the country. In Spokane, Washington, a charismatic leader named Carl Parks opened coffee shops and communes, and preached his interpretation of the New Testament on street corners. Among his converts, was a group of musicians who played in a band called Wilson McKinley, whose prior recording career had included a knock-off country rock album for a budget label. The album was credited to The California Poppy Pickers, a proprietary band name that the label used for multiple recordings by multiple artists. At the beginning of my research process, I was looking for a direct line of causation from San Francisco's Ted Wise—who, according to the book God's Forever Family, as a child "cherished a magazine photo of a Mexican peasant with an array of mind-bending mushrooms"—to Spokane's Wilson McKinley. But the movement seemed more a constellation than a chain of dominos. And then I realized what the Jesus Movement was. It was a meme, the cultural equivalent of a gene, a transmittable idea. Just as Alan Watts and others brought Eastern religions to a counterculture seeking ancient wisdom, so, too, could domestic Christian missionaries bring the good news of Christ. Through a liberal reading of the New Testament, Christianity could be rebranded with a focus on community and salvation—a Sermon-on-the-Mount Christianity, a Jesus-was-a-hippie sort of meme. Under the right circumstances, often during improvisation, a musician can experience a flow state, that is a mental state of effortless concentration, a merging of action and awareness. Neurologically, the experience correlates to a decrease in activity in the brain's default mode network—a complex system associated with thinking about oneself, thinking about others, remembering the past, and planning the future. The default mode network is a sort of buffer between the constructed self and direct experience. It allows us to create a model of how we fit into the world, relative to time and other people. It is also responsible for the vast majority of our mental discord; it's the system that plays our past traumas and missteps on a loop and obsesses over the uncertainties of the future. Recent studies have shown that psychedelics reduce activity in the default mode network, as well. I have a very distinct memory of the first time I played guitar with a drummer. I was 11 or 12, and my friend Tony and I were playing "Come as You Are" by Nirvana. His drums sat in the corner of his parents' basement. Next to the drums, and directly facing me, there was a mirror. I played the opening guitar phrase twice, and then Tony's drum part kicked in and the experience of simultaneously hearing and playing a song caused me to have something like an out-of-body experience. I started to laugh uncontrollably. When I looked up from the fretboard, I caught my reflection in the mirror, and my hands immediately stopped working. I started missing notes and we had to stop. It was like a dream where you're flying—the bliss of the experience calls attention to the fact that you are doing something impossible, so you realize you're dreaming, then your body jolts, and you find yourself awake in bed, tethered once more by gravity. A lot of thought has gone into the historical connection between religion and psychedelics. There are theories—though fringe—that psilocybin mushrooms were the catalyst for human culture and religious ritual. There are claims that ergotized rye (which contains a chemical precursor to LSD) was behind the ceremonial Eleusinian Mysteries of ancient Greece. For those that espouse these ideas, Christian communion is simply an ersatz version of an ancient human ceremony—the taking of a psychedelic sacrament. Technology allows institutions to harness the power of the mystical experience, but something gets lost in translation. The mystical experience relies on the ineffable. And as certain religious memes gain dominance and are absorbed and appropriated into the larger power structures, new memes emerge to fill the vacuum. Such is God in the age of technological reproduction. This appropriation and mass dissemination of memes isn't limited to Christianity, or even religion. This is the nature of culture. To say that history repeats itself misses a key concept about the phenomenon of time. History is recursive. As in other recursive systems, self-similar patterns emerge. Listening to Wilson McKinley, it's not surprising that the recordings they made under the name The California Poppy Pickers were essentially pastiche, a product contrived by a record label to capitalize on a specific meme. 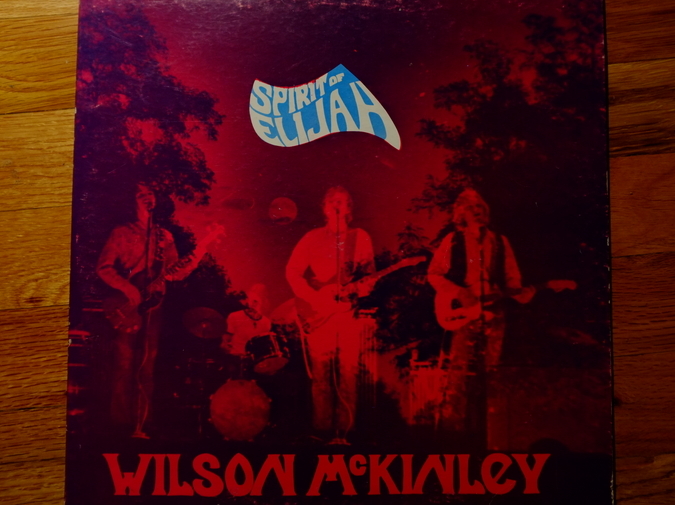 This quality apparently stuck with the band through their religious conversion, and many of the songs on Spirit of Elijah simply sound like slapdash religious knock-offs of secular hits. But it's the failures, the moments that would have been ironed out with a bigger production budget, that give the record its magic. The best parts of Spirit of Elijah are its rough edges. The parts that weren't planned. I've never been a fan of jam bands, but in this case, it's the moments of improvisation that work for me, the parts where the musicians are interacting with one another extemporaneously, feeling the present moment and responding with sounds that convey meaning, but exist outside of language. These moments point to the inexorable link between religion and music, between rhythmic sound and time, between human consciousness and the experience of the ineffable. At one point in the record, during the long jammy end of "One in the Spirit," the song abruptly cuts, no fade out or anything. Apparently, the reel-to-reel ran out of tape. I am now going to try to put into words what I think I “got” from the Van Gogh self-portrait in Chicago, many years after it happened. One of William James's four marks of the mystical experience is a "noetic quality." That is "illuminations, revelations, full of significance and importance" that, though indescribable, appear in the observer's perception like a feeling. For Alan Watts, one of the specific illuminations associated with the mystical experience was the "awareness of polarity," that is to realize "that things which are explicitly different are implicitly one." From The Heart Sutra, one of the best known sutras in Buddhism: "[F]orm is not different from emptiness, and emptiness is not different from form. Form itself is emptiness, and emptiness itself is form." Van Gogh’s self-portrait is composed of heavy brush strokes that are individually discernable. The strokes guide the gaze around the image, creating a sense of movement. Thus, rather than being just a static image rendered in paint, the painting becomes an interactive process. As my eyes swirled around the portrait, the image took on a life-like quality, it gained movement and three-dimensionality. When my gaze settled on the subject's eyes, the image had become so life-like, that I was more or less expecting the painting to wink at me. Instead I found absence. An emptiness that collapsed the animated portrait back into its composite shapes and colors. I repeated this process many times, letting my gaze move through the painting's field, finding at the center, no center at all. Perhaps what I realized is that form and emptiness are one and the same. But of course that's not it. Although it feels true, memory doesn't work like that. Memories are not static objects that live in the mind like artifacts behind glass. Memory is thought, thought is process, and process, by definition, is change. What I experience as recall is not retrieval, but rather a recursive process. I can't hold a memory in my mind without altering it. Like tracing the edges of wet clay spinning on a potter's wheel, the act of touching it changes it drastically. And that's the problem with writing this kind of essay. The memories that I find most compelling are also the most difficult to put into words. As I turn them over in my mind, commit them to the page, edit and rearrange, they become something else, and that something else replaces the thing I was trying to capture in the first place. Perhaps the slippery nature of the ineffable is what drives the human propensity for ritual. We build temples so we know where to return to, choreograph ceremonies so we know the right steps. My grandmother died in November 2017, in San Diego. Her body was flown to Milwaukee to be buried. At the internment, my family sat before the open grave and a Rabbi said some words. He emphasized that we don't bury the dead in dirt, we cover them in earth. He opened a small envelope printed with Hebrew words and explained that the package contained earth from Israel. He sprinkled it into the pit that held her casket. And then we took turns with shovels, filling the hole with earth. It was a beautiful December day, unseasonably warm and perfectly clear. We worked until the job was completed, as the cemetery's gravediggers looked on bemused. By the end, my heart rate was up, and I felt the warm euphoria that follows manual labor, a strange but welcome pleasure to feel at a funeral. Later that night at the synagogue, I found memorial plaques for both my father and grandfather. The hallway that led to the bathrooms was adorned with display cases. One held pictures from the temple's history, including photographs of my father and uncle as children. Others held antiquities from the Holy Land. Peering through the glass was like looking through a window. Here is an oil lamp from the first millennium. Here is a silver coin stamped with the face of Caesar. Here is our most sacred text, rolled up on scrolls like reels of magnetic tape. Here is a photo of my father as a boy. Here is my face, reflected in the glass. I'm looking at myself, trying to look through.